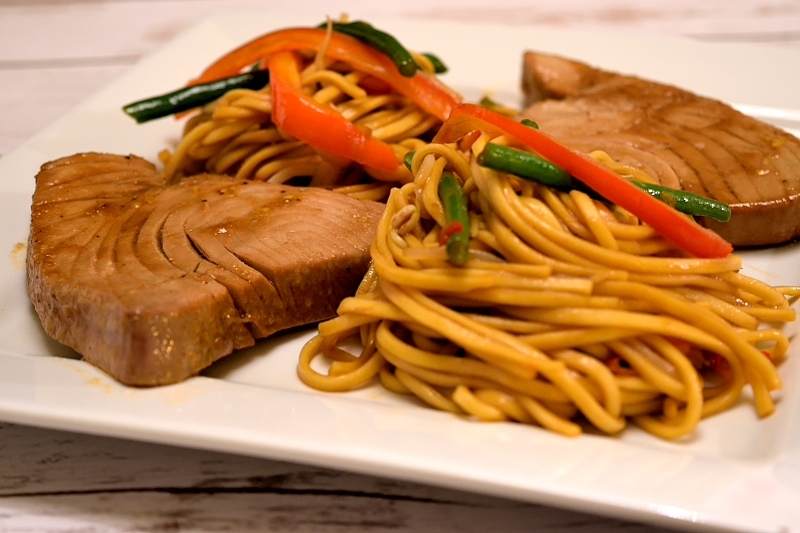 An easy and fast recipe for tuna steaks and noodles with an eastern touch! Teriyaki sauce gives character to the dish, while chilies give the spark. I am not a huge seafood lover. I can eat most fish but I don’t really enjoy it. On the other hand I love octopus, cuttlefish, calamari, shrimps etc. especially when they are grilled or in a nice stew. The funny thing is that I grew up in a family that fish was abundant. My father is a huge fish lover and he could go directly to the fishing boats and spend a fortune on fresh fish. Then I was obliged to eat them. Sometimes he bribed me to do so! Maybe I didn’t like eating fish but I loved fishing. My strongest memories from my childhood is waking up at 6am in the summer and going with my father on a small boat to lift up the nets and catch some octopus. We were amateurs so we didn’t have much success but it was so much fun! Of course we didn’t have a licence to fish so we had some occasional problems with the coast guard. But that’s another story. One of the fish I like eating is tuna. I am not talking about the one in the tin cans that you put on your salads after the gym. I am talking about the real fish. 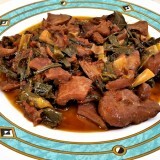 It is very nutritious, healthy and it actually tastes like a red meat steak. Yummy! In this recipe, the trick is to marinade it in teriyaki sauce for some time to absorb the flavours. You don’t need to add any salt on the steak or noodles, the teriyaki is quite salty. 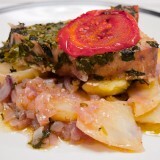 It is quite straight-forward to make, great for dinner on a weeknight. 200 gr (7 oz) bean sprouts. 200 gr (7 oz) green beans. 4 tablespoons of sesame oil. 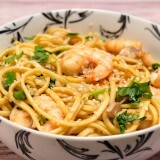 In a large bowl, mix the teriyaki sauce, soy sauce, sugar, vinegar and olive oil. Add the tuna steaks and let them marinate for at least 30 minutes. 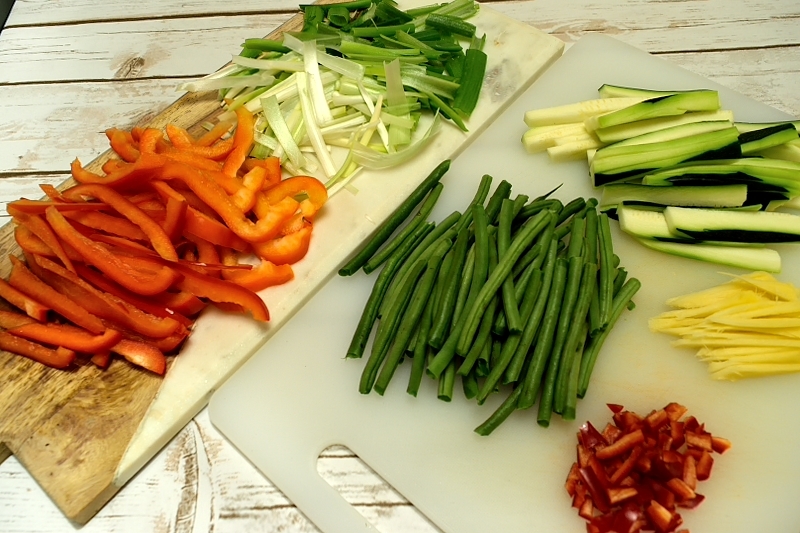 Cut all the vegetables lengthwise into strips, to be consistent with the noodles. Warm up the sesame oil in a large Wok on high heat. Add the green beans and stir-fry them for 3-4 minutes. Add the zucchini and peppers and continue frying for another 2-3 minutes. Keep tossing them. Add the chili peppers, the ginger, bean sprouts and the onions together with a couple of tablespoons of the steak marinade. 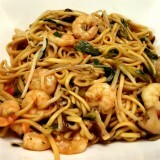 Give it a couple of minutes and add the noodles together with another 2 tablespoons of the steak marinade. Cook for 2-3 minutes while aggressively tossing. When ready, turn the heat off. 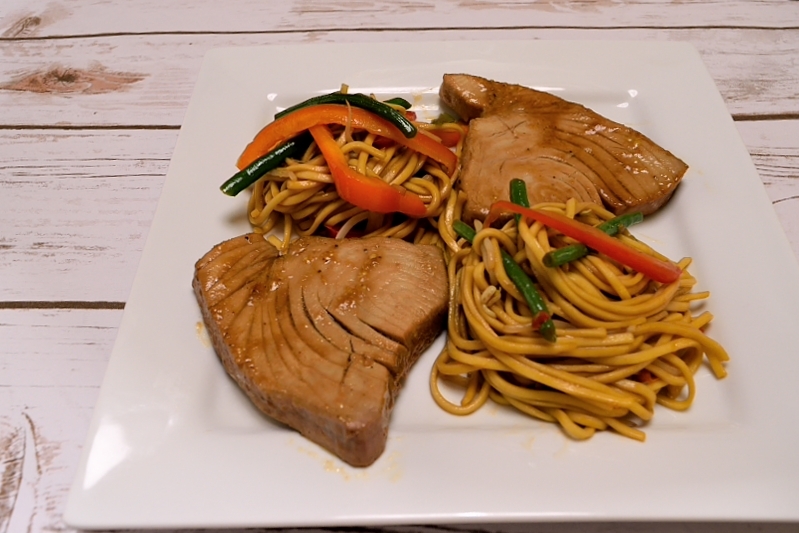 Use a large frying pan and fry the tuna steaks on medium heat. You don't have to use any oil, the steaks are moist from the marinade. Cook each side of the steak for 1-2 minutes. 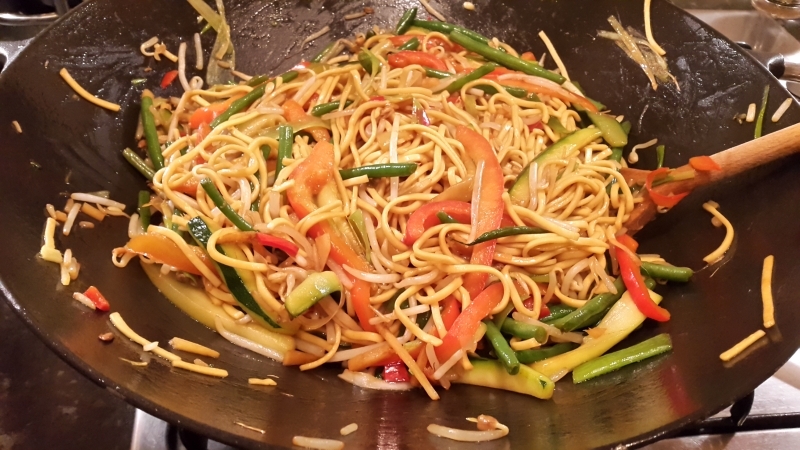 Serve the steaks hot with a generous portion of noodles. Just made this for me and my family and it was delicious. So quick and easy too.